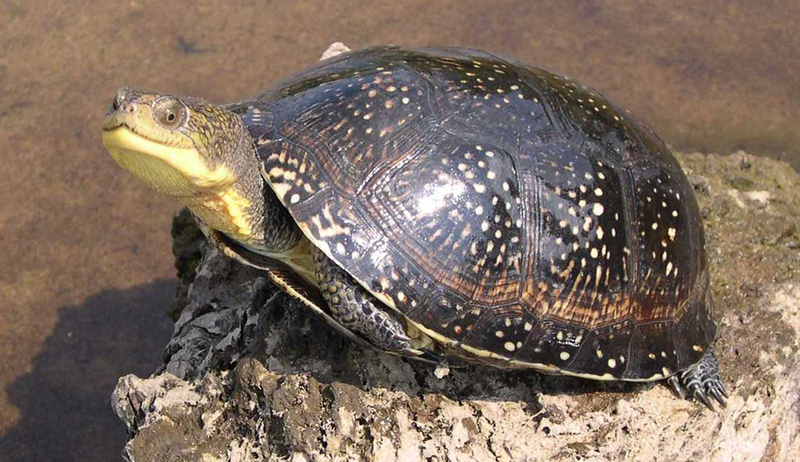 Blanding’s Turtles are semi-terrestrial and are associated with a number of water bodies, including marshes, swamps, wet meadows, backwaters channels of rivers, impoundments and shallow bays of lakes. They strongly favor habitats with abundant emergent and submergent vegetation, although they can be found where these habitat features are less abundant. They overwinter in deeper water or in flowing streams and rivers to avoid freezing, although they do have some limited freeze tolerance. Blanding’s Turtles are most abundant where the uplands are dominated by sandy soils, their preferred nesting soil. Like all turtles, they strongly select open sunny habitats for nesting, such as dry prairies, barrens and savannas. The Blanding’s Turtle was listed as a threatened species in 1979. The lack of observation of young turtles and young adults entering the breeding populations were the primary factors leading to their once-threatened status. While this turtles still remains widespread in its distribution in Wisconsin, being found in 68 of 72 counties, species experts believe that it is continuing to decline as this turtle faces the same problems that the other turtles in the state do. The Blanding’s Turtle was delisted from Wisconsin’s Endangered and Threatened Species List in 2014, despite the fact that the WDNR considered the turtle to be declining at a rate of 10-30%!! Most Blanding’s Turtle “populations” are only known from the observation of 1 or 2 specimens, and because they are so long lived (50+ years) repeated observations may give the false impression that “populations” are doing well. In fact, there is little evidence, at the vast majority of sites associated with documented observations, that a “population” even exists, let alone that the populations is large enough to be self-sustaining. Blanding’s are likely more at risk than the other Wisconsin aquatic turtle species because they are so slow to mature and they often move about far more on land. A study involving Blanding’s Turtles in Lower Michigan showed that nest predation rates have significantly increased since the 1970’s and concluded that if this continues for a generation of Blanding’s turtles, there may be no hope of recovering this species. This study was conducted over a span of nearly 30 years (Congdon, et al. 1993). One means of addressing the conservation and recovery of Blanding’s Turtles is through headstarting. Headstarting helps to insure somesuccessful hatching and reduces the turtle’s maturation period, often by 3-5 years. We have been headstarting Blanding’s at a number of locations over the past several years to bolster populations. While this conservation measure will not remedy all the issues that this species faces, especially related to habitat loss and fragmentation, it is one means of perpetuating existing populations. Headstarting can also beused to help establish new populations where habitat projects in the state restore and/or create habitat conditions that favor this species. In 2013, Turtles For Tomorrow helped start a long-term telemetry study involving headstarted Blanding’s Turtles with UW-Whitewater University, with Dr. Josh Kapfer, one of our board members, as a lead on the project. Nineteen headstarted juveniles were fitted with radio transmitters and were released at their natal site. The goal was to track the turtles to maturity to determine survival rates while also gathering data on home range sizes and habitat preferences. We had expected to conduct the study for 13-15 years, but a combination of predation and lost or failed transmitters ended the project after only four years. The project was a disappointment and was terminated in 2016. You can find more details about this study by looking at the Highlights Section of this website.